WINTER LEAGUE RETURNS » The Honolulu Sharks of the Hawaii Winter Baseball League held their first practice yesterday at Les Murakami Stadium in Manoa. The Sharks are among the four teams that make up the new league, which opens its season tomorrow. 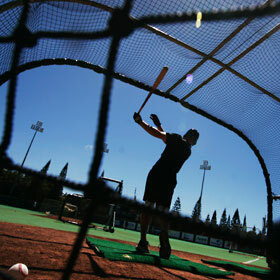 After nine years, winter baseball returns with high hopes for talent and attendance. The state finds gaps in finances, inventory procedures, hiring of coaches and more. Abercrombie adds Kalaeloa and Makua to the defense bill. He reports the unit's recent losses are not preventing progress. Isle students struggle to adjust to an abundance of choices. Houston comes back to help UH sweep the Bulldogs. Hawaii knows all about the damage that a lower-division program can do to a season. Maui Land & Pine is laying off 6 percent of its work force. A proposal to lengthen the term limits for City Council members from eight to 12 years will be on the ballot in November.